How Resilient are the Canadian Oil Sands to Carbon Constraints? Findings about the resilience of oil sands production to carbon constraints are highly sensitive to modeling assumptions. Activity in the oil sands sector is sensitive to the design of climate policy. Canada’s oil sands are likely to be more resilient to carbon constraints than estimated by MIT. 2) The impact on oil sands activity is highly dependent on the design of climate policy. This figure compares the impact of climate policy on Canadian oil sands sector output as estimated by Navius with that estimated by MIT. To learn more about this research, please contact Jotham Peters. 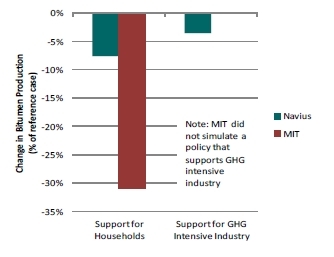 How do Industrial GHG Reduction Efforts Affect Demand for Skilled Labour? Is British Columbia’s Carbon Tax Good for Household Income? Melton, N., J. Axsen & S. Goldberg. 2017. Evaluating plug-in electric vehicle policies in the context of long-term greenhouse gas reduction goals: Comparing 10 Canadian provinces using the PEV policy report card. Energy Policy, 107, 381-393. Bataille, C. & N. Melton. 2017. Energy efficiency and economic growth: A retrospective CGE analysis for Canada from 2002 to 2012. Energy Economics, 64, 118-130. Wolinetz & Axsen. 2017. How policy can build the plug-in electric vehicle market: Insights from the REspondent-based Preference And Constraints (REPAC) model. Technological Forecasting and Social Change 117: 238-250. Bataille, C., N. Melton & M. Jaccard. 2015. Policy uncertainty and diffusion of carbon capture and storage in an optimal region. Climate Policy, 15(5): 565-582. Jaccard, M., N. Melton & J. Nyboer. 2011. Institutions and Processes for Scaling Up Renewables: Run-of-River Hydropower in British Columbia. Energy Policy, 39(7): 4042-4050. Peters, J., C. Bataille, N. Rivers, & M. Jaccard. 2010. Taxing Emissions, Not Income: How to Moderate the Regional Impact of Federal Environment Policy. C.D. Howe Institute, 314: Toronto, ON.